Umm Salamah (ra) relates that the Prophet ﷺ said, “If anyone puts on Ihram for Hajj or Umrah from Masjid Al-Aqsa and then proceeds to the Sacred Masjid (Ka’bah), their past and future sins will be forgiven, or they will be entered into Paradise”. (Abu Dawud). This hadith outlines the importance of performing hajj or umrah from Masjid Al-Aqsa, no other place has this distinct virtue of performing hajj or umrah besides Masjid Al-Aqsa. 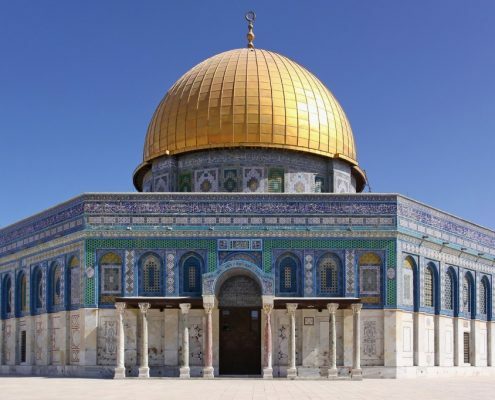 Furthermore, the Messenger of Allah (peace be upon them) said: “Do not travel to visit any mosques except three: Al Masjid Al Haraam [in Mecca], this mosque of mine [in Medina] and Masjid Al-Aqsa [in Jerusalem].” Narrated by Bukhari and Muslim.